A LINE of hungry patrons snaked out to the parking lot at Masu's Massive Plate Lunch in Liliha to get one last hefty serving of kalua pig, lau lau or teriyaki chicken. The 30- to 45-minute wait to reach the counter at the popular plate lunch eatery didn't bother patrons yesterday morning. "It's the best plate lunch on the island," said Makiki resident Larry Coode, who picked up a kalua pig plate lunch on the eatery's last day. Large mahalo banner signs hung outside Masu's at 1808 Liliha St. to thank customers for their patronage after 34 years of business. "That is really the most precious asset a business can have ... loyal customers," said owner Paul Masuoka, 63, who is retiring. Generations of families have been coming to the establishment for years. Three of Masuoka's six nieces and nephews, Jolyn Rosa, Jodi Chew and Brandon Masuoka, helped behind the counter and in the kitchen yesterday. "We have a lot of memories here with our grandma, uncle and cousins," Rosa said. Regular employees worked busily, scooping up large portions of food into Styrofoam containers. Family friend Marlene Imahiro stopped by to give Masuoka chocolate-chip and oatmeal cookies that she baked. Along with the large servings, many patrons said they will miss the affordable prices, old-style Hawaiian music and friendly ohana atmosphere. "Paul is a very giving person. Just look at the wall, look at all the people he's been in contact with," Imahiro said as she gestured to the wall of framed photos of local celebrities and leaders. Imahiro said her two daughters had previously helped Masuoka at the eatery. "You feel like part of the family," she said. 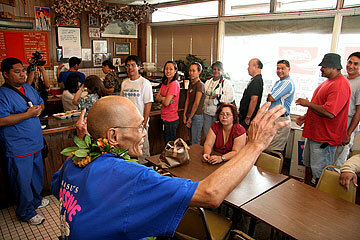 During the lunch rush hour, Masuoka passed out numbers and a few people who stood in line won memorabilia such as framed Masu's T-shirts and trophies Masu's received for serving the best plate lunch. Near the celebrity wall, Masuoka's friends, entertainers Tony Bee and the Bee Sisters -- Esther L. Nakoa and Carol M. Kahawaiolaa -- performed while people waited in line. Masuoka took a short break from the kitchen to thank customers. "I really mean it. Thank you all. You guys are the ones that made us last this long," he said. "I'm not going to miss the work, but I'll miss all you guys." In the 1970s, Masu's began as a catering business called Livingston Food Service on Waimanu Street operated by Masuoka and his mother, Yoshiko. They decided to serve plate lunches to supplement the catering business. Success of plate lunches took off, prompting them to cease the catering business. Masu's was moved to Kamaile Street and then to the Liliha Street location 15 years ago. "We couldn't have survived without the loyalty of our customers," Masuoka said.